Another layer of security that senangPay has is TAC number. This security feature applies to all debit card transactions and FPX Internet Banking that happened using senangPay Payment Form. TAC is a unique 6-digit code that you can generate on a device (TAC on Device), receive via SMS (TAC on SMS), or generate via Internet Banking on your mobile phone (TAC on Mobile). The TAC number is provided by the bank to ensure that the transaction or purchasing payment from the customer is valid and authorised by the customer itself. The TAC number is depends on the customer’s bank. May I see example on TAC number? Kindly please refer the image below. 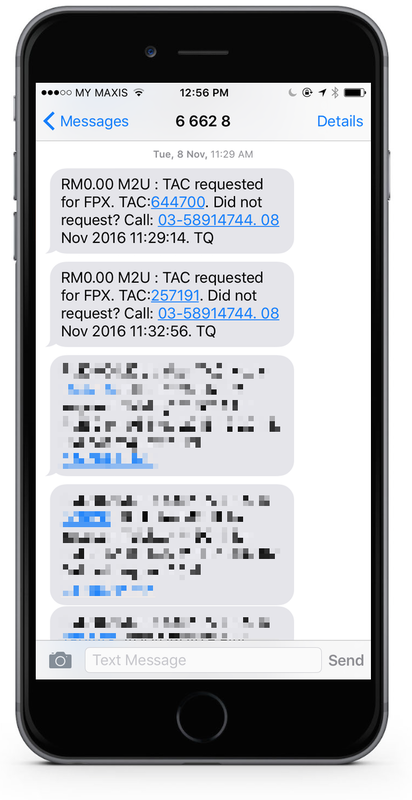 This is an example of TAC number from Maybank. May I know all details regarding the TAC number? You can simply read the detail of the TAC number from the bank itself. Kindly select your bank from the link below. What kind of fraud that TAC number protects from? 1. Only account holder can make payment through the senangPay Payment Form. 2. Nobody else can make the payment through senangPay Payment Form unless he steals the account holder’s mobile phone, with assumption that he / she has an access to the mobile phone to get the TAC number. What is the benefit of TAC number to merchant? 2. Bank protects account holder / customer from being fraud, thus this leads to a free of mind in using Internet Banking. 2. senangPay integrate with TAC number secure features with local banks.